Sarah is a Research Fellow based at the Division of Language and Communication Science. 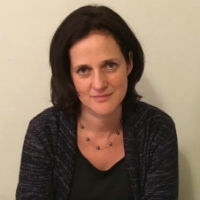 She worked as a Speech and Language Therapist on the Isle of Wight and for Lambeth Primary Care Trust before completing a PhD examining the social impact of stroke and aphasia. Since her PhD she has led two small-scale projects. The first was a proof-of-concept study exploring Solution Focused Brief Therapy with people who have post-stroke aphasia; the second analysed Speech and Language Therapists’ experiences in addressing the psychosocial needs of people who have had a stroke. In 2015 she was awarded a City University 12 month Postdoctoral Fellowship Award. More recently, she has received the Stroke Association Jack and Averil (Mansfield) Bradley Fellowship Award for Stroke Research. Sarah’s first degree was in Music at Cambridge University, and she went on to study piano accompaniment at the Royal Academy of Music in London. She subsequently retrained to become a Speech and Language Therapist at City University London in 2002. While working at Lambeth Primary Care Trust as a clinician she became increasingly aware of the social and psychological impact of stroke and aphasia. Her research interests lie in exploring ways to support the emotional and social well-being of people post stroke. Sarah’s research focuses on improving psychosocial well-being for people with stroke and aphasia. There are two broad strands to her research. Firstly, she is interested in research that explores ways to enable people with aphasia to make meaningful and positive change in their lives. She has a particular interest in Solution Focused Brief Therapy, and has recently received the Stroke Association Jack and Averil (Mansfield) Bradley Fellowship Award to enable her to conduct a feasibility study (the SoFIA trial). This study will explore how best to adapt this therapy approach for people with both mild and severe aphasia; the acceptability and perceived benefits; as well as examine the feasibility of carrying out a future large-scale trial into clinical and cost effectiveness. Secondly, Sarah is interested in exploring the psychosocial impact of stroke, both the ‘lived experience’ of having a stroke using qualitative methodology, and also adapting and developing outcome measures that are accessible to people with aphasia. For example, as part of her PhD, she developed the Stroke Social Network Scale which enables both those with and without aphasia to self-report on their social network, enabling clinicians to identify those at risk of becoming socially isolated. Northcott, S., Simpson, A., Moss, B., Ahmed, N. and Hilari, K. (2018). Supporting people with aphasia to ‘settle into a new way to be’: speech and language therapists’ views on providing psychosocial support. International Journal of Language and Communication Disorders, 53(1), pp. 16–29. doi:10.1111/1460-6984.12323 . Northcott, S. and Hilari, K. (2017). “I’ve got somebody there, someone cares”: what support is most valued following a stroke? Disability and Rehabilitation, 40(20), pp. 2439–2448. doi:10.1080/09638288.2017.1337242 . Hilari, K. and Northcott, S. (2017). “Struggling to stay connected”: comparing the social relationships of healthy older people and people with stroke and aphasia. Aphasiology, 31(6), pp. 674–687. doi:10.1080/02687038.2016.1218436 . Northcott, S., Simpson, A., Moss, B., Ahmed, N. and Hilari, K. (2017). How do speech-and-language therapists address the psychosocial well-being of people with aphasia? Results of a UK online survey. International Journal of Language and Communication Disorders, 52(3), pp. 356–373. doi:10.1111/1460-6984.12278 . Northcott, S., Moss, B., Harrison, K. and Hilari, K. (2016). A systematic review of the impact of stroke on social support and social networks: Associated factors and patterns of change. Clinical Rehabilitation, 30(8), pp. 811–831. doi:10.1177/0269215515602136 . Northcott, S., Burns, K., Simpson, A. and Hilari, K. (2015). 'Living with Aphasia the Best Way i Can': A Feasibility Study Exploring Solution-Focused Brief Therapy for People with Aphasia. Folia Phoniatrica et Logopaedica, 67(3), pp. 156–167. doi:10.1159/000439217 . Fotiadou, D., Northcott, S., Chatzidaki, A. and Hilari, K. (2014). Aphasia blog talk: How does stroke and aphasia affect a person's social relationships? Aphasiology, 28(11), pp. 1281–1300. doi:10.1080/02687038.2014.928664 . Winkler, M., Bedford, V., Northcott, S. and Hilari, K. (2014). Aphasia blog talk: How does stroke and aphasia affect the carer and their relationship with the person with aphasia? Aphasiology, 28(11), pp. 1301–1319. doi:10.1080/02687038.2014.928665 . Northcott, S. and Hilari, K. (2013). Stroke Social Network Scale: Development and psychometric evaluation of a new patient-reported measure. Clinical Rehabilitation, 27(9), pp. 823–833. doi:10.1177/0269215513479388 . Caute, A., Northcott, S., Clarkson, L., Pring, T. and Hilari, K. (2012). Does mode of administration affect health-related quality-of-life outcomes after stroke? International Journal of Speech-Language Pathology, 14(4), pp. 329–337. doi:10.3109/17549507.2012.663789 . Northcott, S. and Hilari, K. (2011). Why do people lose their friends after a stroke? International Journal of Language and Communication Disorders, 46(5), pp. 524–534. doi:10.1111/j.1460-6984.2011.00079.x . Hilari, K., Northcott, S., Roy, P., Marshall, J., Wiggins, R.D., Chataway, J. … Ames, D. (2010). Psychological distress after stroke and aphasia: The first six months. Clinical Rehabilitation, 24(2), pp. 181–190. doi:10.1177/0269215509346090 . Hilari, K., Lamping, D.L., Smith, S.C., Northcott, S., Lamb, A. and Marshall, J. (2009). Psychometric properties of the Stroke and Aphasia Quality of Life Scale (SAQOL-39) in a generic stroke population. Clinical Rehabilitation, 23(6), pp. 544–557. doi:10.1177/0269215508101729 . Hilari, K. and Northcott, S. (2006). Social support in people with chronic aphasia. Aphasiology, 20(1), pp. 17–36. doi:10.1080/02687030500279982 .